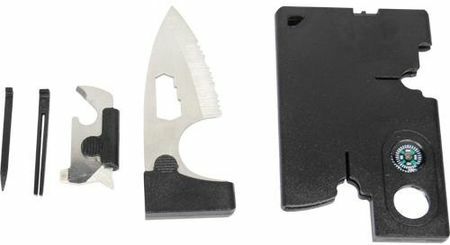 Survival pocket card tool can be used for outdoor camping, fishing, hiking, and everyday use. It has 10 essential tools that fit right in your pocket, wallet, or purse. The survival card is a thin and lightweight multi-function tool. It is a must have survival tool and makes a perfect gift for just about anyone. Many women carry these around because of the versatility of this survival card. The serrated stainless steel blade is a useful cutting tool. This survival pocket card tool is so light and slim that you'll barely know you have it, yet when needed you'll find it's amazingly useful.